How fast can a team construct a water-worthy vessel? The first weekend of May 2019 is a delight of DIY-big proportions around Bodega Bay. Why? Crafty teams'll construct boats, then sail them, all within a matter of hours. BODEGA BAY WOODEN BOAT CHALLENGE, a spectacular centerpiece of the Bodega Bay Fisherman's Festival, and it involves adult teams and youth teams quickly but accurately creating sail-ready vessels. And we do mean "ready," for the boats'll go onto the water moments after the last build task is completed. How does this all work? 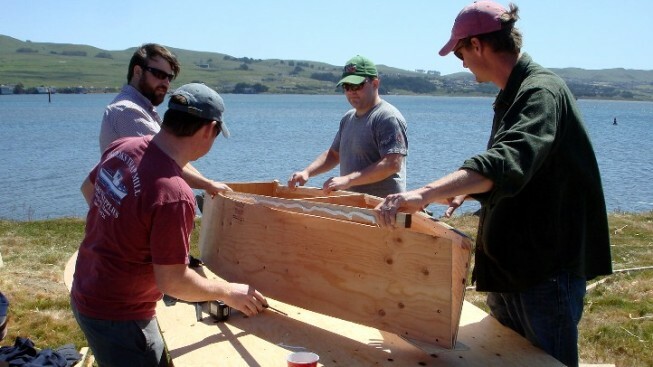 An adult team has three hours "... to build wooden boats from scratch — before racing them through a marked course in the bay!" That's right: There's hardly a breather between assembly and action, all of which you get to see if you're nearby at Westside Park. The youth teams will have four hours to complete their boats. As for the dates? May 4 is the day to be there for the adult races, while the younger builders will race on May 5. THE 2019 FISHERMAN'S FESTIVAL... has a number of festive happenings swimming through its schedule, including food trucks (for sure, seafood will be a tasty theme), a pet parade, the Blessing of the Fleet, live entertainment, and a whole caboodle of water-close goings-on.